Today's Color Challenge from SCS (CC375) is Night of Navy, Bashful Blue and Pumpkin Pie - a fabulous color combo!! The dessert is Father's Day, but I decided to skip dessert today. I used one of my "go-to" layouts ... clean and simple. Hope you like this paper-pieced CAS card made from all SU! products. I stamped the image three times; once onto Whisper White card front, once onto Pumpkin Pie polka-dot DP, and once onto a scrap of white (for cutting out the raindrops for on top of the umbrella). 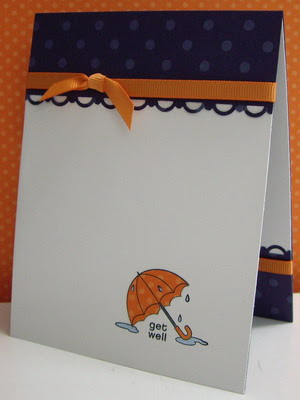 I colored in the water puddles with my Bashful Blue Stampin' Write markers and the handle with Gray and Pumpkin Pie. I cut out the top of the umbrella from the polka-dot DP and glued it onto my card front. I colored the raindrops (from the scrap white), cut them out and mounted them on top of the umbrella. I punched the scalloped border from the Night of Navy polka-dot DP. Tip: when punching borders, especially with darker colored patterned paper, I find that the cut edges show white - so I sponge them with the corresponding ink color - here I sponged the edge with Night of Navy to give it a cleaner look. I mounted all the pieces as shown in the photo above onto the card front and then mounted the whole thing onto a card base of Night of Navy for stability (this also ensures that the ribbon is glued between the card front and base to hold it securely. For the inside I used a Whisper White panel, adding the scalloped Night of Navy polka-dot border (same depth as the front), but mounted it at the bottom of the panel, adding a straight piece of Pumpkin Pie ribbon (no knot). Labels: CAS, get well, paper piecing, Stampin' Up! 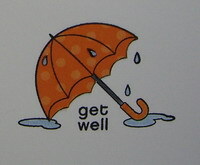 I love the layout and the little umbrella is darling. Sweet! I LOVE umbrellas! Gorgeous CAS card! love it!